September is Library Card Sign-up Month, a time when the American Library Association and libraries nationwide join together to remind parents, caregivers and students that signing up for a library card is the first step towards academic achievement and lifelong learning. A public library card is a ticket to free educational resources and activities such as homework help, digital workshops for all-ages, STEAM programs/activities, book clubs, family storytimes and game nights. A library card also provides access to a variety of digital media, including ebooks. Recent figures show more than 93 percent of public libraries offer ebooks and other digital content. According to OverDrive, more than 200 million checkouts of digital content at libraries is expected throughout 2016. If you haven’t been to your local library lately, September is a great time for a visit. 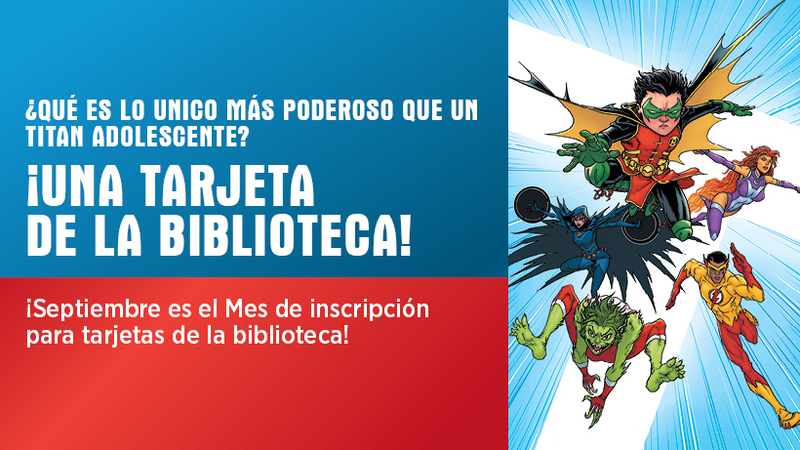 This year, DC Super Heroes, the Teen Titans, will team up with the American Library Association (ALA) to promote the value of a library card. As honorary chairs, DC’s Teen Titans will remind parents, caregivers and students that signing up for a library card is the first step towards academic achievement and lifelong learning. The Teen Titans are a young group of crimefighters who keep the world safe from the clutches of evil. From Starfire’s green energy beams and power of flight to Raven’s telekinetic and psychokinetic abilities, the Teen Titans have the power, courage and teamwork to rise to any challenges thrown their way. Head to your library during September to see what’s new and take part in the celebration. Libraries across the country are participating. Do you have friends who don’t have library cards? Invite them to the library. 2. Tell us about your library superpower. Everyone loves superheroes, not just because they do great things, but also because they inspire us to be our best selves. And there’s no better place to discover and develop your superpowers than at the library. In honor of our 2017 Library Card Sign-up Month Honorary Chairs, DC’s Teen Titans, we’re asking you to share your library superpower. What special talents, skills, and interests have you developed thanks to the library? Tell us—or show us with a photo or short video—on Twitter or Instagram using the hashtag #LibrarySuperpower. Entries can also be posted directly to the I Love Libraries Facebook page. One randomly selected winner will receive a VISA gift card worth $100.00 USD. Promotion begins Friday, September 1 at noon CT and ends Thursday, September 22 at noon CT.
Librarians and the general public are encouraged to participate. Join in the fun and tell the world about your #LibrarySuperpower. 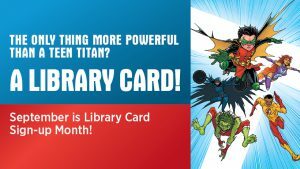 The only thing more powerful than a Teen Titan is a library card! Other ways to show your support for libraries on social media. Follow I Love Libraries on Facebook and Twitter and the hashtag #LibraryCardSignUp to join the celebration on social media. Change your Facebook cover art during September. Cover art is also available in Spanish. Our Library has an on-going book sale in the basement. The selection includes everything from children's books to magazines to best selling novels. We have also included used dvds and vhs tapes and some computer programs! Come in and check it out today! Sat. 9:00 – 12:00 you may call the Library at 402-693-2512 to renew your items.